Company Name : TechJini Solutions Pvt. Ltd.
> 2) Should be able to prepare scenarios and derive test cases. > 3) Should be proactive in test cases execution, defect discussion, defect logging, risk identification. 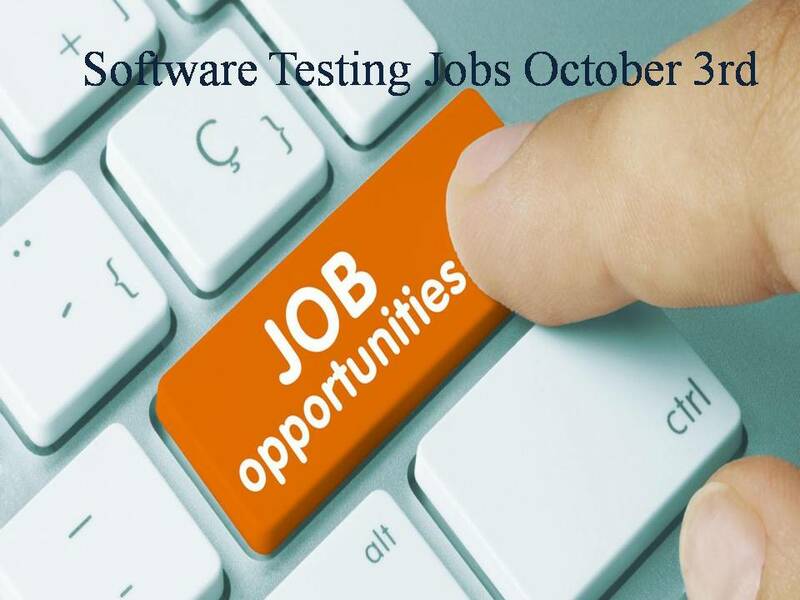 > Lodestone Software (Ahmedabad) is a testing focused company (with a team of 250+ testers) and we are looking for people with a strong drive to build a career in software testing. This position requires strong attention to detail and understanding of software concepts and to be applying them to drive quality of the mobile applications that we test. We work with teams spread across the globe and in a very fast paced technical environment. > If you are interested – please respond with the below details so that we can schedule an interview accordingly. > 2. If selected – time period required to join. > 3. Preferred interview Date / Time. > Defining the testing activities for subordinates – testers or test engineers. > All responsibilities of test planning. > To check if the team has all the necessary resources to execute the testing activities. > To check if testing is going hand in hand . > Candidates are working in Non-IT is willing to shift in IT Field can also apply. > Create automated test cases. > Prepare and report test results and statistics. > Recommend and implement testing tools and testing methods. > Participate in triage meetings. > Recommend design changes for improvement of the products. > Ability to design highly extensible and scalable Automation Frameworks.Experience with automation frameworks, API testing for REST web services and related automation.Experience in UI and mobile automation using tools like Selenium, Appium. > To work as department head of product performance testing and evaluation fabric and garments to validate the product compliance in the supply chain with respect to the defined standards. > End To End test cycle exposure such as Integration /Functional/ System/ Regression along with DB testing, along with root cause analysis. > Strong in manual and automated testing, writing scripts, helping in Azure deployments etc. Contact Company : Allegis Services India Pvt. Ltd.
Our software engineers at Fiserv bring an open and creative mindset to a global team developing mobile applications, user interfaces and much more to deliver industry-leading financial services technologies to our clients. Our talented technology team members solve challenging problems quickly and with quality. We’re seeking individuals who can create frameworks, leverage developer tools, and mentor and guide other members of the team. Collaboration is key and whether you are an expert in a legacy software system or are fluent in a variety of coding languages you’re sure to find an opportunity as a software engineer that will challenge you to perform exceptionally and deliver excellence for our clients. At Cerner India, we are looking to hire a Test Automation Engineer for our Certification Organization. As a Test Automation Engineer you will be developing and maintaining automated tests in our automated testing system. You will be responsible for automating test cases in our test automation framework as well as augmenting the framework to evolve with the products under which it is used to test. Company Name : Ness technologies (I) Pvt Ltd.
> Experience with distributed source control systems such as Git. > Experience with Continuous Integration (Jenkins/Hudson/Maven/Ant), SVN and basics of dev-ops concepts (Docker/AWS). Contact Company: Ness technologies (I) Pvt Ltd.
Oracle Public Cloud(OPC) is built to provide Software as Service(SaaS) Infrastructure as Service(IaaS) and Platform as Service(PaaS) offerings of key Oracle products including the Oracle Database, Fusion Middleware, and Fusion Applications. With predictable subscription pricing, our cloud delivers instant value and productivity for end users, administrators and developers. Our fully managed environment is built using the award-winning Oracle Exadata, Oracle Exalogic, Oracle Database, and Oracle WebLogic products while adding built-in identity management, high availability, elasticity, backup, and monitoring to enable secure and scalable applications. > Good exposure on Web-services and API testing with API testing tools. > Understanding of complete STLC. > Good to have exposure on Manual Testing. > 5. Assist dev team to Perform root cause analysis and determine cause of problems in order to develop specific solution to an issue. > Review project test and implementation schedules. Monitor, document, and report the current status of projects. Participate in review of project deliverables. – Create detailed test plans, test cases, and data for project testing. > Perform automated and manual testing and validate results to confirm adherence and conformance to installation standards and methodologies. > Review user manuals for accuracy. > Document problems, monitor resolutions and retain documentation necessary to plan for future assigned testing. > Adhere to and enforce consistent company and department testing standards and procedures. > Identify, document, and implement process improvements. We welcome you to be a part of this renowned organization and will be glad to discuss suitable opportunities with you across our service lines.